Trapped! Escape Room Inland Empire. Upland, California - Book Now! Book any room Monday through Thursday and save 10% off! You will be locked in a room with a small group of people. You have 60 minutes to search the room, find the clues, solve the puzzles and get out in time. You will need to use logic, creativity, and teamwork to escape. 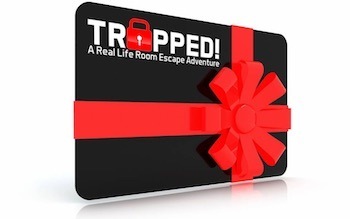 Real-life room escape games are a type of physical adventure game in which people are put into a scenario where they have to use elements of the room to solve a series of puzzles, find clues, and complete the objective within a set time limit. Why choose Trapped! Escape Room? *Excluding special events. Recommended minimum age to participate is 12 years old. Participants under 18 must be accompanied by an adult. You have been tracking the criminal mastermind “The Puzzlemaster” for years. You have found his hidden lair; now can you find the evidence and escape? I’ve been to a bunch of escape rooms in Southern California, but Trapped! in Upland is without question my favorite. It’s the one place I have found that strikes just the right balance of having good production values, and also being fun, suspenseful, logical, and (most importantly) fair. I have never been in a room there that I thought was unfair or that there was no way someone ever would have figured it out. The puzzles and locks all make logical sense why they would go together, and everything is quite possible to solve (without hints even) if you just pay attention and you follow the logical flow of the room. These escape rooms are the BEST in my humble opinion. The team of Trapped did an amazing job with their rooms. Third generation, not traditional lock n keys rooms at all. Sector 13, sooo cool and fun. Down the Rabbit Hole…OMG!! This is what escape rooms are about! My gf and I have done 48 escape rooms and this place is in my top three hands down! We often talk about how great the rooms are and how much fun we had in them. If your even remotely thinking about doing one, this place will not disappoint! TRUST ME!! Trapped has, by far, the most immersive story-driven escape rooms i have experienced in Southern California. The best part of this location is how passionate they are. You can tell they try really hard to create a unique experience and to make sure you are having fun. The Trapped! Escape Room Upland location was established in 2015. Ever since, this location has been a hit with tourists and locals from around the Southern California area. In fact, Trapped! gets customers visiting from around the world, in addition to its local customers here in the Inland Empire, Pomona, and San Bernardino. If you’re looking for a fun and unique activity to do with your friends, family, or even entire office, then check out the various rooms here in our Upland location to see which ones would best suit you and your group.